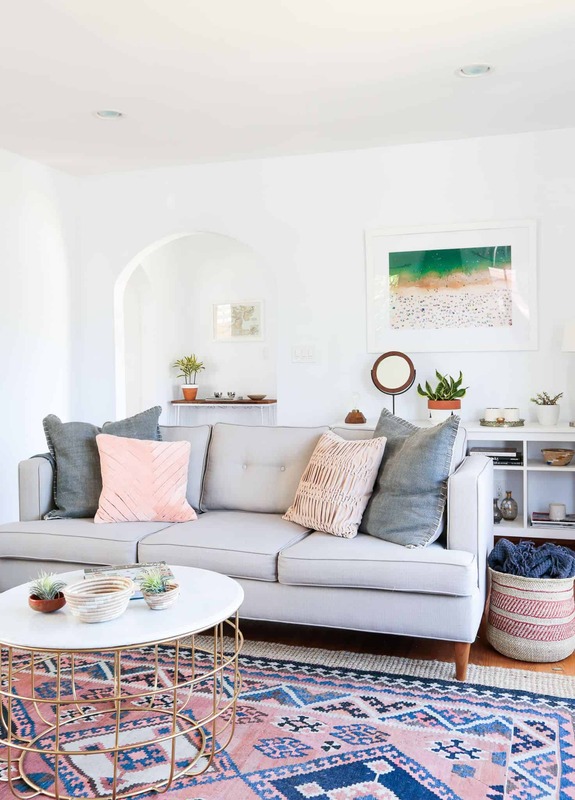 While many may not think much of their coffee table, other then it holds drinks when needed or tired legs after a long day, your coffee table can make or break your space. 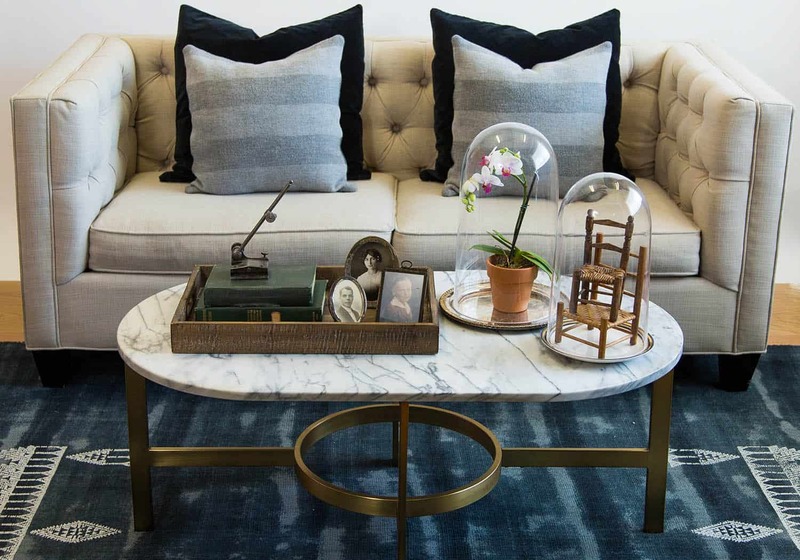 Think about it, your coffee table truly completes the look of your living room; therefore, it only makes sense for you to style it the right way. 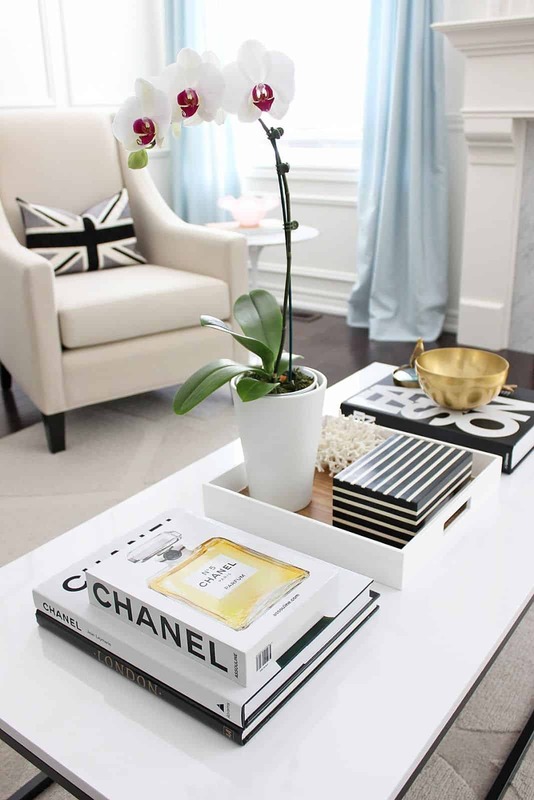 Here are a few feminine ways to-style your coffee table. A glass top is exceptionally great because it will match perfectly with all of your different decorating styles. Add colorful bits on top to bring that eye-catching element to your coffee table. Feminine touches usually consist of using items that have a softer element to them- that is where glass comes into play. 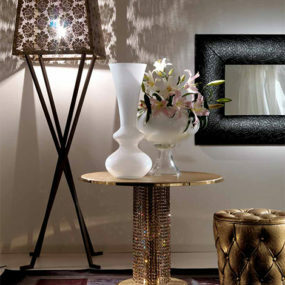 If you are in doubt of what type of table to add to your living room, opt for a glass top. Glass tables are excellent addition due to how soft and versatile they are. Whether you decide to use a plant or a larger piece the options are endless. The key is working with a statement piece that creates a focal point directly towards it. Add minimalist touch surrounding your statement piece for the perfect blend. 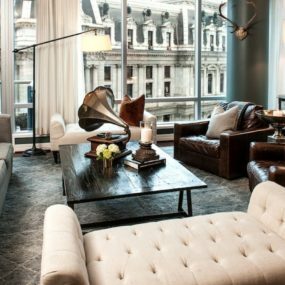 While most of us love the idea of layering different items on the coffee table to create a wide range of character, many don’t. Instead of layering bits and piece of décor here and there add one statement piece that reflexes your personality. An eye-catching piece could be just what your living room needs. Adding a sentimental value to your coffee table is an excellent form of bringing a bit of your essence to your living room decor. Consider adding in bits that make you feel good and remind you of your parents or grandparents or even your native country. Whether it’s a book your mother gave you, or a ceramic cup your grandmother loved, having a sentimental piece weaved into your décor is always a good idea. Contemplate displaying the item, and allowing it to become the main conversation piece of the room. When it comes to finding a unique touch you want to have something that will create an intricate feel to the room. Consider having a table that is completely different from the rest of the room in order to bring that solid difference. 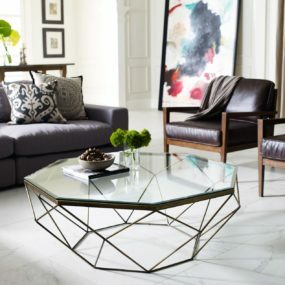 In order for your coffee table to make the statement, it was intended to make you might want to consider having a unique table. 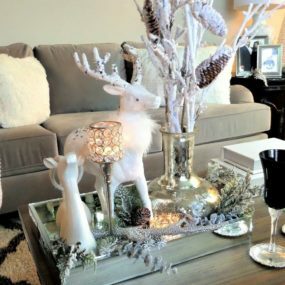 Having a singular unique table, or multiple unique tables clustered around is a great way to bring the visual focus in a modern feminine way. A minimalist approach is perfect for those that want to take a minimal approach to a feminine table. Add small trinkets or accent bits that brighten the room in a smaller manner. Additionally, add colorful touches to have that seamless brightening effect. Feminine décor isn’t always about what you add into the space, but rather how the area makes you feel. 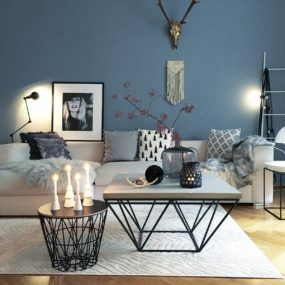 For a feminine vibe that is crisp and clean add a minimal table, this will work exceptionally well if you already have heavy furniture in the room. We love a tall element because it elongates the room. There’s something welcoming yet beautiful having this strong, tall element that warms up the room at the same time. Add a tall floral for the perfect pairing. Who doesn’t love a tall, beautiful arrangement? Giving your living room some height is great when you have a smaller table or a smaller area that needs a bit of elongating. Add in a tall chic arrangement and pair it with small tidbits for the perfect balance. A rustic touch doesn’t always mean you need to incorporate wood bits. 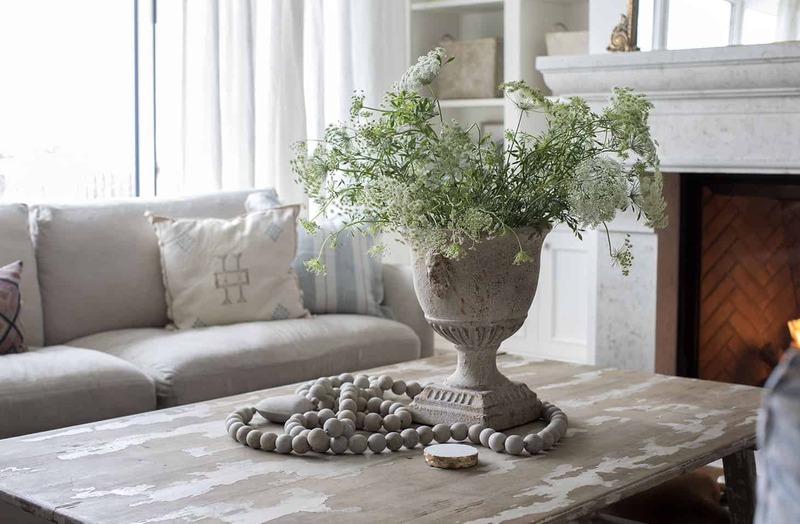 In fact, we recommend using a blend of colors and textures to bring that rustic-chic appeal. 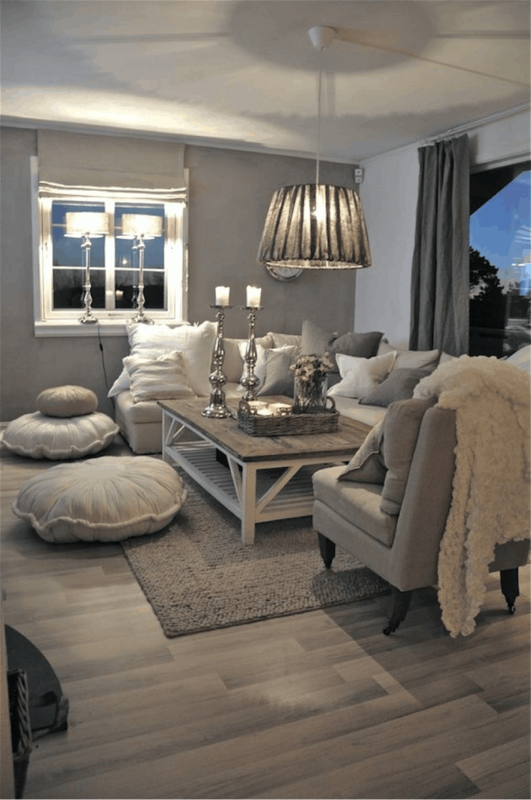 Keep the rest of your as decor with neutral bits bring further emphasis your rustic twist. Blending in styles is always a good idea especially when you are working with a rustic touch. Rustic décor is perfect for those that love a farmhouse feel yet when pair with a feminine touch the rustic becomes a whole lot chicer. Add in a wooden feature and pair with softer bits such as a vase or even ceramic bits. 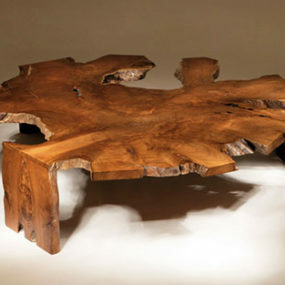 You may even want to consider having a tree stump as a table. What better way to display the most beautiful words written by poets and authors then to have them on your coffee table for all to love and enjoy. Pair with bright flowers to add a feminine yet romantic touch. There’s no way we could’ve done this guide without incorporating the most feminine touches of them all- flowers and books. If you are seeking a classic way of decorating your living room coffee table, flowers and books is one way to go. Consider a simple floral arrangement and pair with your favorite colorful books. This will create a uniquely feminine blend. A pouf is an excellent alternative towards adding additional decor, especially if you are looking for something that doubles as seating. You can use it as additional seating or as a decorative piece that blends seamlessly with your table. What better way to play with feminine touches, color and texture than to add a pouf. 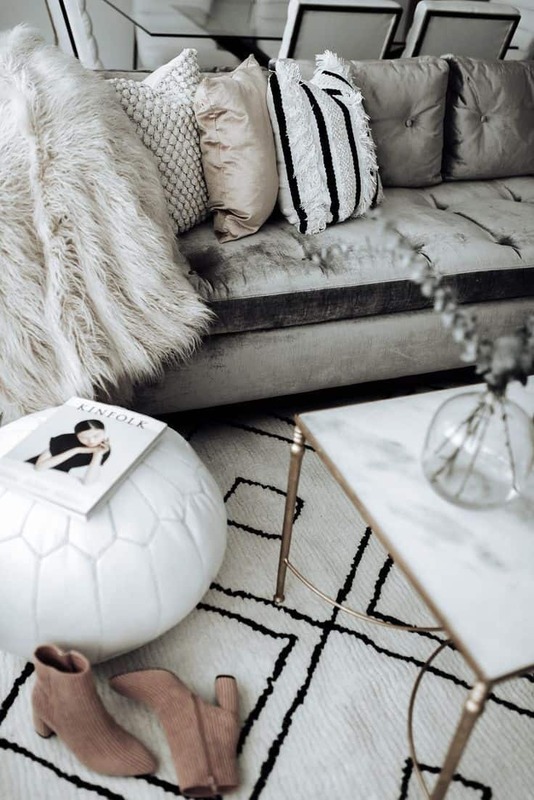 Adding a pouf to your coffee table not only bring visual appeal but it adds texture and even extra seating. What better way to display your favorite trinkets than to have them on a double layered table. The table is compact and convenient while being a top contender as it displays your favorite bits in the utmost beautiful way. Whether you have a table with two layers or not you want to pay close attention to the space underneath. Doing so will add an additional layer of decorating that brightens the area. Additionally, you can add books, display a few items or do both. 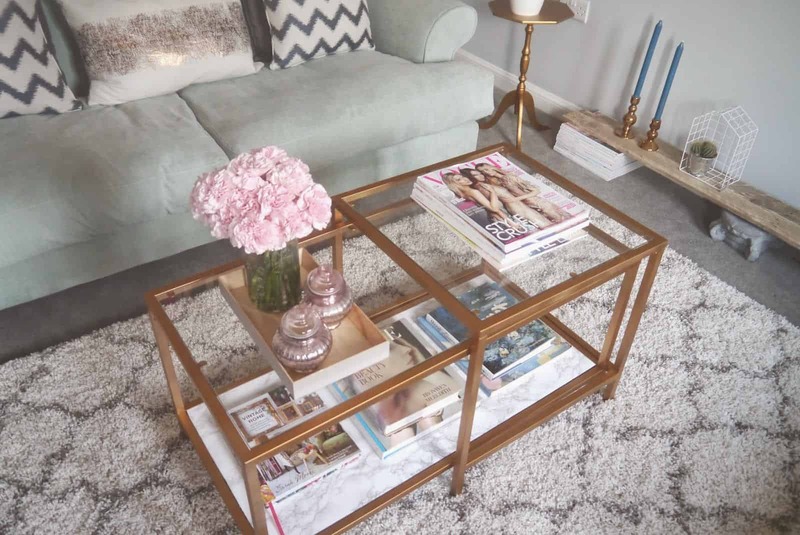 We love the concept of having a blush coffee table. It’s super chic, and feminine while having just the right amount of beauty. If you are not fond of pink consider pastel hues or even a beige with pink undertones. When in doubt pink it out! Pink has become such a staple color due to it being extremely versatile. Its versatility comes from the multiple shades the color comes in. From the brightest hue to the lightest any shade of pink will bring that feminine touch we all know and love. A layered look is always a good idea, especially when you are working with two or more rugs that are different yet similar in a way. 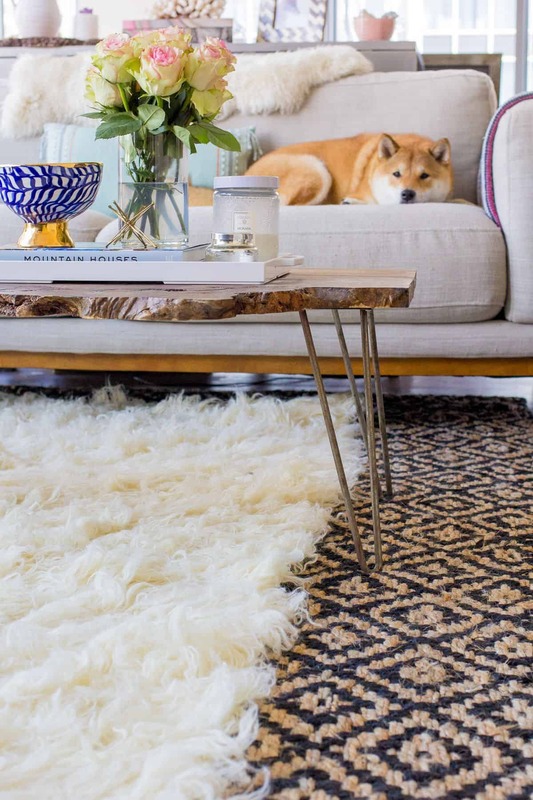 Keep in mind the rugs should be different in size, texture, and color, for the perfect look. Right underneath your table add a fluffy rug. 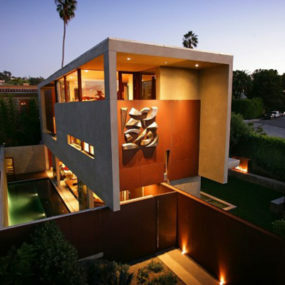 That area is sometimes overlooked; furthermore, that space is typically left unused. Instead of not using the area, add a fun rug to bring that whimsical feel we all know and love. 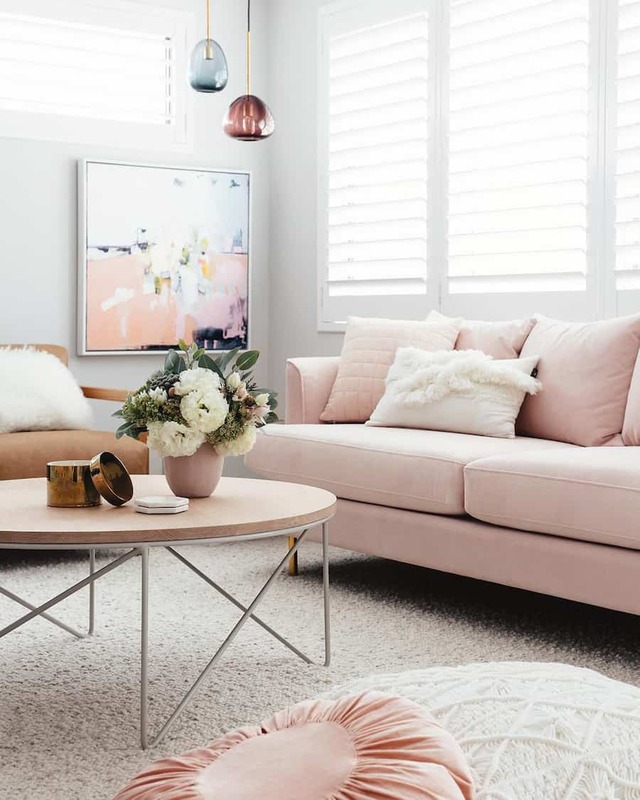 A feminine touch doesn’t always mean using pastel hues or having simple décor; it simply means bringing a woman’s touch to a classic beautiful space. Which of these is your personal favorite? Share with us your thoughts below.